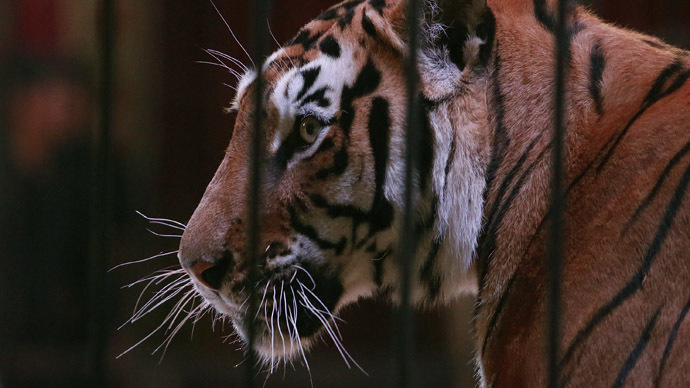 What do you get when a pack of tigers escapes a safari park after a tornado? 'Tigernado' hashtags, internet memes and a parody Twitter account, of course! But don't necessarily believe everything you read, because it seems the tigers never really escaped. It all started after exotic animals were reported missing from Tiger Safari in Tuttle, Oklahoma on Wednesday. Local law enforcement took the situation very seriously, warning residents that dangerous animals could be prowling the streets. But the panic later subsided, with the Sheriff's Office stating that the animals had been contained. Those behind the images certainly earned their stripes for creativity. This tweet shows tigers flying above a sign that reads 'The end is near' as a tornado barrels behind them. Anyone wishing to go outside could check the forecast, which showed the percentage chance of tigers in the area. Residents surely found it more useful than a typical rain app. A parody account was even launched, allegedly run by one of the tigers themselves. But as the fierce felines were trending on Twitter, the safari park's owner said that none of his animals had actually escaped. "Nothing's loose, no animals got loose," Bill Meadows, the park's owner, told New York Daily News on Wednesday. "Not a one went missing. I'm not aware of where that news came from." Meadows' park consists of 23 tigers and more than 100 other animals. He had a sense of humor about the situation, calling it "funny as hell" because no one got hurt. He said that whoever made up the rumor will likely make lots of money, adding that he is happy for them. Those hoping to wear the official 'Tigernado' survival t-shirt would also be undoubtedly bummed. Meanwhile, Meadows did say the premises sustained "major, major structural damage" due to a tornado sweeping through the state. He predicted the repair costs could reach the tens of thousands. The twister led to at least 12 injuries, destroyed homes, and prompted Oklahoma City to issue a flash flood emergency for the first time in history. Kansas and Nebraska were also affected by the tornado.